Why did a mattress company open a newsroom? Former journalists have always been valued in marketing: They understand the components of a good story, they know the culture of a newsroom, and they can write. But in 2016 we see a growing trend in marketeers hiring journalists to work as journalists, not PR pros. Their role is to create a community around a brand, rather than write content that is exclusively concerned with sales: Think of the documentaries on counter-culture presented by Doc Martens. Media consumers value content that digs a little deeper; they want to feast on something that offers them sustenance rather than SEO junk, and journalists are equipped with the skills to ask good questions, find interesting sources and ensure that articles are reader-focussed. It has been almost seven months since the New York-based mattress company Casper opened a newsroom. The self-described “sleep startup” hired journalists to work on its online publication, Van Winkle’s, which is funded by Casper, but isn’t part of their marketing budget. Gawker-founder and former editor-in-chief of the New York Observer Elizabeth Spiers was hired as Editorial Director, with journalist Jeff Koyen as editor-in-chief and three other editorial staffers. The two ventures share the same office space, but Van Winkle’s doesn’t feature reviews of Casper’s products or report company news. In fact, mattresses are a “blacklisted” topic. Why? Because mattresses just aren’t all that interesting. So what is the purpose in funding the publication? There weren’t any media outlets specialising in the topic for Casper to partner with, so they decided to create their own. The intention is that the site will “own” the topic of sleep as a niche. They then become the “go-to guys” when it comes to sleep and wellbeing. 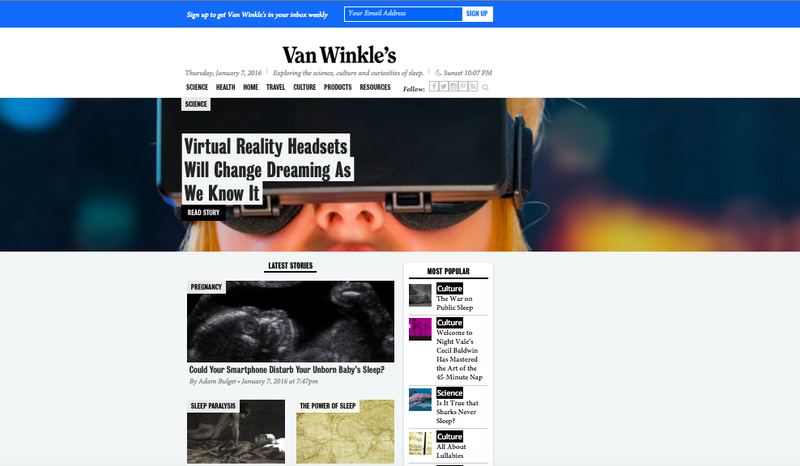 And there is a host of material available to cover: Van Winkle’s publishes at least 10 original articles every day, including in-depth features, investigative reports and columns. The material has nothing to do with Casper’s products, but it helps establish them as the powerhouse behind all things sleep. An important feature of their model is syndication. They disseminate material to websites that are hungry for content. One of their biggest customers is Huffington Post. The idea is that their material does not push the sale too much — it is a slow burner that will eventually build a community and play an active role in shaping the company’s brand voice. The learning outcome for PR pros is that brands should focus on building lifestyles, rather than simply looking for material that is blatantly about increasing sales. Good content marketing is about creating something is actually entertaining and newsworthy, and today’s media consumers are becoming much more fussy about what they consume. Check out MediaHQ.com’s upcoming course on brand storytelling.